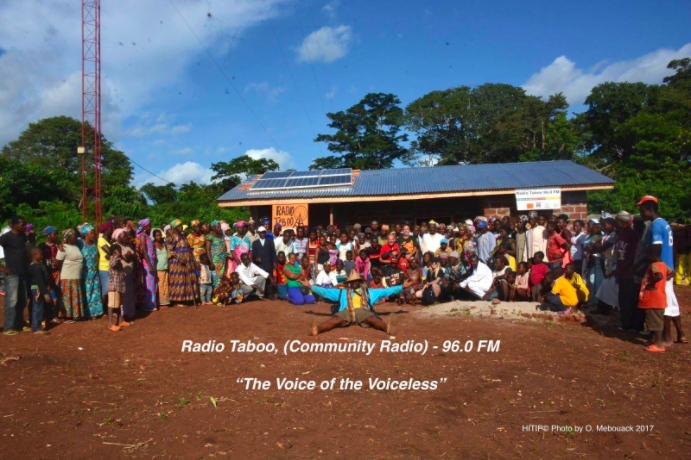 Thank you for supporting our current innovative project Radio Taboo, a development community radio station. We are providing radio to thousands of people who never listened to radio before. Radio Taboo was recently featured on The Sound Kitchen podcast! Click here to listen. Hope International for Tikar People (HITIP) is a non-profit, community-based organization established to improve the quality of life for marginalized indigenous Tikar and Bedzan (Pygmy) people in Cameroon. HITIP collaborates with local villages to implement sustainable health, education and art projects to meet the needs of at-risk individuals and communities as a whole. HITIP was founded in 2002 in direct response to the needs of community members with immediate and critical health care needs. Ibrahim, a young survivor of polio who was desperately in need of a custom bicycle wheelchair, inspired the inception of HITIP. Immediately after Issa Nyaphaga, founder of HITIP, met Ibrahim he decided to take action. Through educating others about the challenges facing the Tikar people and partnering with communities and non-profit organizations in Cameroon, the United States and France, HITIP was able to raise the grass roots funds to provide Ibrahim with his first wheelchair. Ibrahim enjoys his newfound sense of independence as he is now able to make the 3 km trip to school every morning on his own. This success for Ibrahim has inspired a series of other projects for marginalized Tikar and Pygmy populations. Since 2002, HITIP has provided medicine, emergency medical supplies, shoes, books, school supplies, school bags, clothes and toys to seven villages in the Tikar region. "I know people who are wasting a lot of resources and money every day... And I know people who need that help. How can I go to sleep without doing anything?! I don't want to make people feel guilty, I just want to connect the two worlds." 2012 - "Water4Social Peace" - Rotary Global Peace Award, Berlin - Germany. Hitip is a member of Slow Foods International!